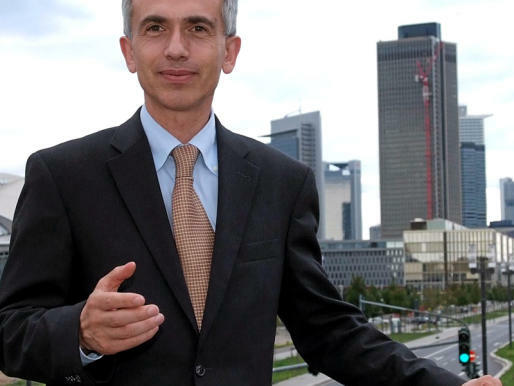 As reported in The Times of Israel, Peter Feldmann, a leading member of the German Social Democratic Party, won Frankfurt’s mayoral election with 57.4 percent of the vote. He campaigned on a platform prioritizing social issues like affordable housing. Notably Feldmann is the second Jew elected mayor of Frankfurt–the fifth largest city in Germany (and is its wealthy financial capital). Frankfurt’s last Jewish mayor, Ludwig Landmann, held the office for nine years until he was removed by Nazi terror in March 1933. The Times of Israel mistakenly claims Feldmann to be the first Jew to “reign” over a large German city since World War II, since Hamburg elected Herbert Weichmann, son of a Jewish doctor, to be its Lord Mayor between 1965 and 1971. (German social democrat Max Brauer, mayor of Hamburg between 1957 to 1960, was not a Jew, even though he attended the lectures of Altona Rabbi Joseph Carlebach and, in exile, spoke out against Nazi antisemitism throughout the 1930s). Feldmann is by no means the first Jewish politician in Germany since World War II: Hesse Attorney General Fritz Bauer chased Adolf Eichmann and ran the Auschwitz camp guards trials in the 1960s. Rudolf Katz became Schleswig-Holstein’s Minister of Justice and later Deputy Chief Justice of the Germany’s Federal Constitutional Court. And Gregor Gysi leads Germany’s center-left Die Linke party. Feldmann regards himself as “a liberal Jew,” and believes, like so many other Europeans, that faith is a private matter. However, Feldmann’s discretion has not stopped him from supporting his religious community from within the party-political sphere, just like Catholics and Protestants counterparts. In 2007 he became a founding member of the Jewish caucus of the German Social Democratic Party. (Where are the Jewish caucuses in the FDP and CDU/CSU?) Feldmann lives in the second largest resurrected Jewish community in Germany (about 8,000 registered members, while Berlin is the first with 11,000 registered members). Seventy years after Heinrich Himmler told Hitler that Germany was judenrein, there is a wave of growing Jewish communities across the country, including a burgeoning community in Nuremburg. Where Hitler marched his brownshirts and promulgated the Nuremburg laws, the Juedische Kultusgemeinde (statutory religious community) has more than 1,400 registered community members, and is bursting at the seams of its synagogue and community center, which were built in the mid-1980s. Feldmann’s election isn’t news because it shouldn’t be a surprise. It is normal and good in any democratic society for all citizens, regardless of ethnic background, to be free to seek elective office. Feldmann is an ordinary citizen aiming to serve his fellow Germans, just as Jews like Ludwig Landmann, Hugo Preuss, Walther Rathenau, and Paul Hirsch wanted, in much more turbulent and scary times. Feldmann’s election is unremarkable as it ought to be unremarkable–a commonplace. How many people trumpet Mike Bloomberg’s mayoralty in New York as being a triumph for the Jews, as opposed to the billionaires? And we so often forget that Mark Green is an MOT–just like he, me, and (I blush to suggest…) thee. Should We Care About Günter Grass’s Vaguely Anti-Semitic German Poetry? Product of the Westchester prep school, Abigail learned the etiquette of lawn parties with porcelain Barbies from the age of 5. Now graduated to bankers and lawyers of the most rarified knickerbocker circles, she is like Ivory soap 99 and 44/100th percent pure. Gregor Gysi is not Jewish, though many people think he is. He does not practice the Jewish religion. His father’s mother was Jewish, but that does not make his halakhically Jewish either. Gysi he is secular Jew as are big parts of Israel’s society too. Calling the party “Die Linke” (i. e. the left) center-left is like referring to Fidel Castro as a mainstream liberal. “Die Linke” is in fact a rebranding of the former ruling communist party in East Germany who were joined by some disgruntled former members of the Social Democratic Party (SPD). Prominent politicians of “Die Linke” are notorious for their vicious attacks on Israel (advocating a boycott of Israel, calling Gaza a concentration camp, calling Hamas attacks on Israel “fireworks” etc.). Feldmann is not a practicing jew, either. He is a confessing atheist and in private conversations mocks religious jews. However he uses his jewish ancestry when he thinks it benefits him for his personal career. Great news — and I’ve heard that he’s working to provide affordable housing to the local Muslim population too. Nice to see everyone getting along for a change. Hi there Oliver and Year 6.Your topic sounds rellay interesting. My class will be learning all about World War II next term and I was wondering if you could help me out. They will be finding out what it was like to be a kid during World War II. Could you give them some help? Know you know all about World War II what would it have been like to be a kid growing up during the war? What were the good bits and the bad bits? What would they have seen, heard, felt? How did the war affect them and their lives?My class would love to hear from you. It would rellay help their learning!. Why would an article on Jewish politicians in Frankfurt… manage to fail to even name-check Ignatz Bubis??? ?